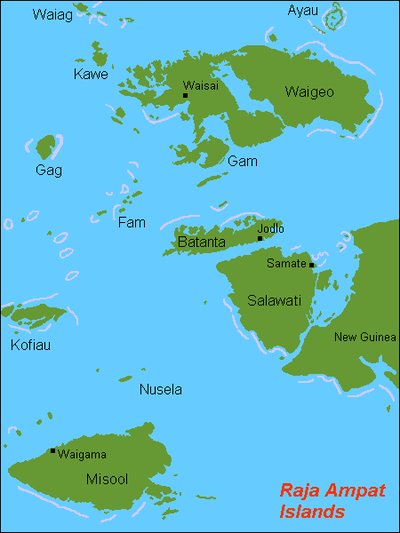 Raja Ampat sits atop the Bird's Head Peninsula, off the northeastern coast of West Papua, Indonesia’s moat easterly province and formerly Irian Jaya, occupying the western half of the huge island of New Guinea. Exotic? Mysterious? This fascinating, vast and rugged province is both. Indeed it was perhaps the last of planet Earth’s regions to remain untouched by civilization. In 1770 Captain Cook and his landing party set foot on the western shores of the island and a volley of arrows sent them packing from a territory then inhabited by headhunters. Fortunately, a more welcoming reception awaits visitors these days! Known as the Four Kings, it is an archipelago made up of over 1,500 small islands, cays and shoals surrounding the four main islands of Misool, Salawati, Batanta and Waigeo. It encompasses more than 8.3 million acres (33,750 km²) of land and sea and is roughly 150 x 225 kilometres. The area is vast and is 10% bigger than the country of Belgium. Transportation is only possible by a combination of plane and boat. BiodiversityRaja Ampat is home to many endemic species, like the ‘walking sharks’. Still today scientists travel here to find new species, both above and below water. 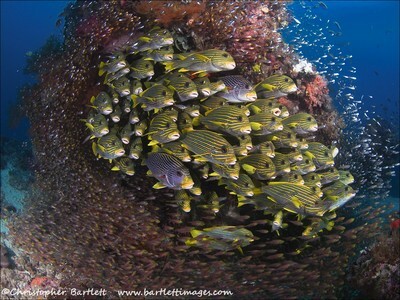 Divers can expect to see large numbers of schooling fish, manta rays, at least three species of pygmy seahorses, wobbegongs, bumphead parrotfish, giant trevally, barracuda, schools of big-eye jacks, blacktip and whitetip reef sharks, and just about every reef fish and critter in the books. 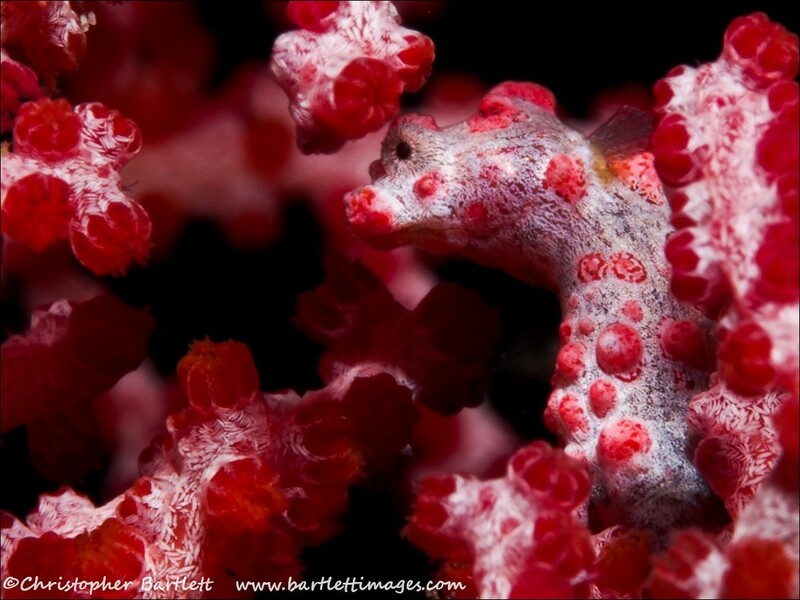 All of this is set against a vibrant backdrop of the world’s healthiest hard and soft corals. On land expect a lot of birds and other wildlife like lizards and the Cuscus – a furry marsupial that often can be spotted in the evenings. Increasingly well-known as the world epicentre of marine biodiversity, the islands of Raja Ampat offer a world of thrilling big fish encounters, the chance to see new species, pristine reefs of hard and soft corals and some of the world’s most intriguing macro creatures. Raja Ampat's reefs are home to over 700 species of molluscs and over 1,400 species of coral reef fish (including at least 25 endemics known only from this region), 600 species of hard coral (75% of the world’s total and over ten times the number of coral species found in the entire Caribbean), and 57 species of mantis shrimp (including eight endemic species). 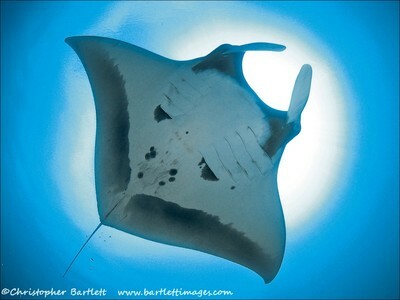 Reef Mantas (Manta alfredi) are easily seen from October to June, and Giant Mantas (Manta birostris) are found on other sites from January to April. Other important features include karst forests full of rare orchids, birds of paradise, tree kangaroos, regionally-important green and hawksbill turtle rookeries, whale and dolphin aggregations, and the world’s largest Pacific Leatherback Turtle nesting beaches in the Jamursbamedi-Warmon coast of the Northern Bird’s Head peninsula. 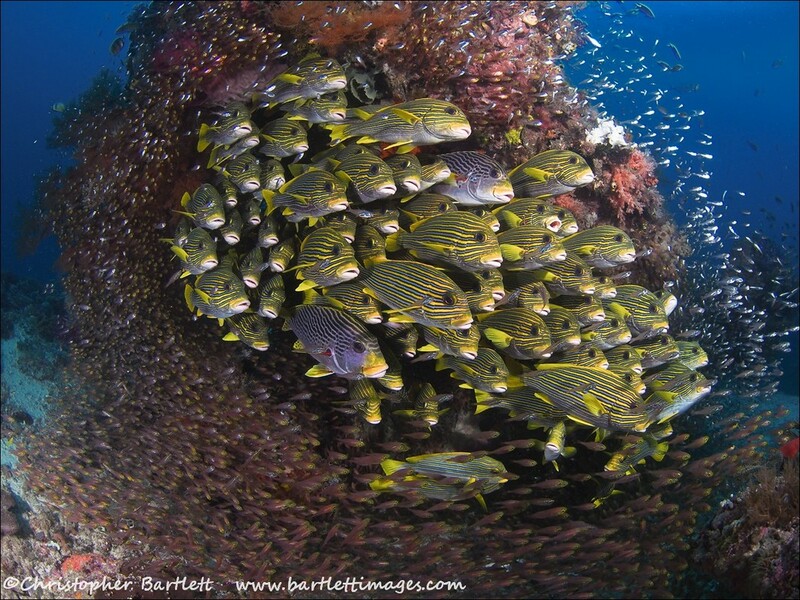 This diversity is protected by a network of Marine Protected Areas and no-take zones, resulting not only in world-leading diversity but also great abundance. 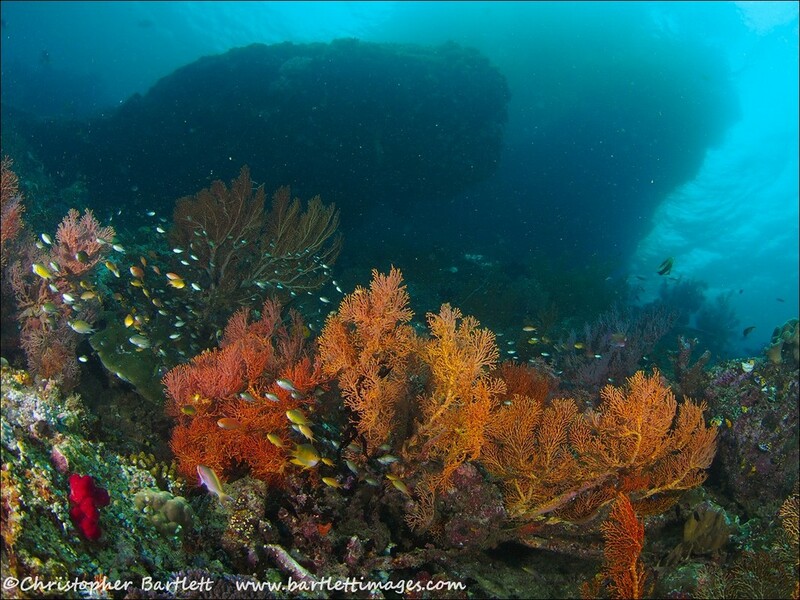 Other than Papua New Guinea, these are the fishiest reefs we have ever dived. 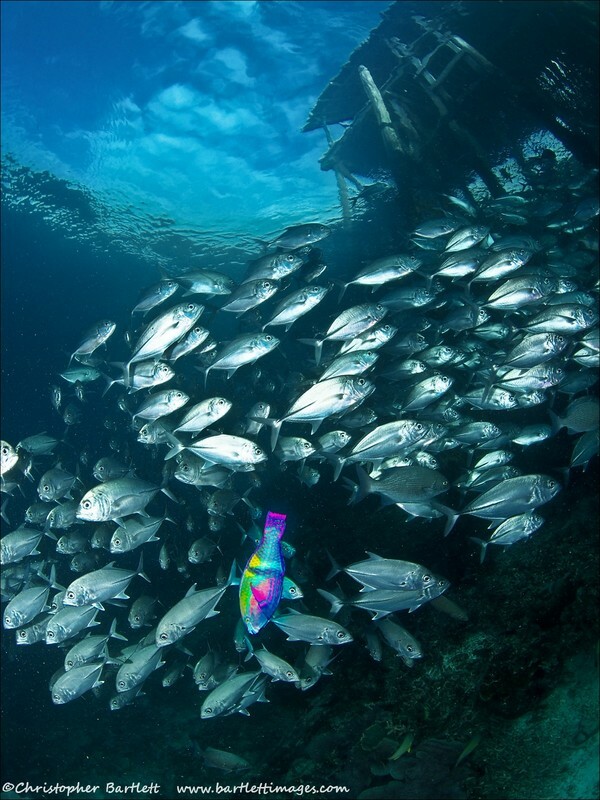 Raja Ampat can be visited by liveaboard, of which there are now many working in the area, or dived from resorts. The pick of the bunch are Misool Eco Resort in the south (closed between mid-June and mid-September), and Kri Eco Resort and its neighbour, the more upmarket Sorido Resort, both on Kri Island in the north and open year-round. 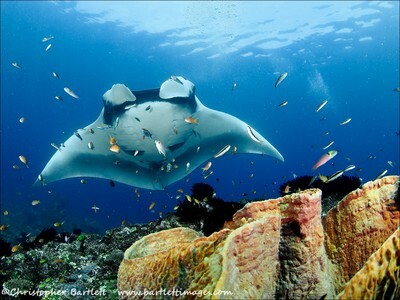 Raja Ampat can de dived from remote islan resorts or liveaboards. Getting to any of them requires two flights to Sorong from Jakarta or Bali, and then a boat ride, all of which we can take care of. Misool Eco Resort, built in 2005, is five hours away, and transfers are arranged on specific days to accommodate seven or 12-night stays, or a combination of these. Seven nights at Misool with unlimited diving ranges from €2940 euros to €3650 euros per person. There are 25 dive sites within a 15-minute boat ride from the dive centre.Located in the centre of the Dampier Strait, Kri Island is closest to the biggest King, Waigeo – famous for its birdlife and it’s also there where the French naturalists Jean René Constant Quoy and Joseph Paul found the first Black Tip Reef shark in 1824. Here the Pacific Ocean meets the Halmahera Sea resuliting in an explosion of marine life. With regular strong currents, big fish feel especially comfortable. Manta rays, reef sharks, different schools of mackerel, tuna and barracuda are seen again and again. Dolphins and whales (Bryde's whales, pilot whales) are often seen on the surface. Kri Island is 90 minutes from Sorong, with free transfers on Sundays and Wednesdays. The dive site Cape Kri, just in front of Sorido Bay and a five-minute boat ride from Kri Eco Resort is officially the world’s most bio-diverse reef. In 2012 renowned marine scientist Dr Gerry Allen counted 374 different fish species in a single dive. For seven nights with unlimited diving, Kri Eco Resort stays cost €1455 and Sorido Bay charges €2705. There are 30 dives sites within a 10-km radius, and the weekly dive schedule plans one extended trip a week to visit the reef manta sites at Manta Sandy, Arborek Island, and Manta Drop-off. Other optional trips are offered each week to The Passage, a visual delight and really quite different from most reef sites, and the extra-colourful reefs of Fam Island. Diving at Kri first started in 1993 with tents on the beach, and has evolved to its current configuration of bamboo and thatched stilt water bungalows, whilst Sorido Bay with its brick walls, air-conditioning and flat screen TVs was opened in 2007 by the owners of Kri Eco Resort. The majority of liveaboards visit the area from October or November to April, and depart from Sorong too, spending some time around the Kri area. The better ones also take in parts of Misool to the south or Wayag and Fam to the north, and once a year run a Sorong to Flores itinerary in May or Flores to Sorong around October/November as they move their vessels between their summer season itineraries around Komodo and their winter grounds of Raja Ampat. The cheaper ones tend to stick around the Kri area and don’t even go as far as Fam and as a result are not, in our opinion, worth using. You see a wider range of sites for less money, without being confined to a boat, from Kri Eco Resort. Of the boats that do a full tour, there are either luxurious "boutique" liveaboards such as the Arenui, Dewi Nusantara, and the Seven Seas, or comfortable vessels such as the Mermaid I. 9 nights and 10 days on the Mermaid start at €2400 and the boutique boats start at €3900 for 11 nights. Other activities in Raja AmpatIt’s not all about diving either, or doesn’t have to be. Bird watching trips to see the Red Bird of Paradise can be organised, as can kayak safaris lasting from a few days to over a week, with or without a guide, and village homestays. For more information on the resorts, liveaboards, and kayaking, please visit the relevant pages using the menu on top.